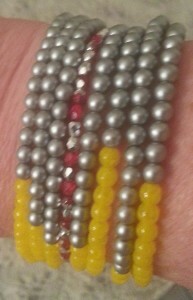 I think beading is more prolific than knitting. 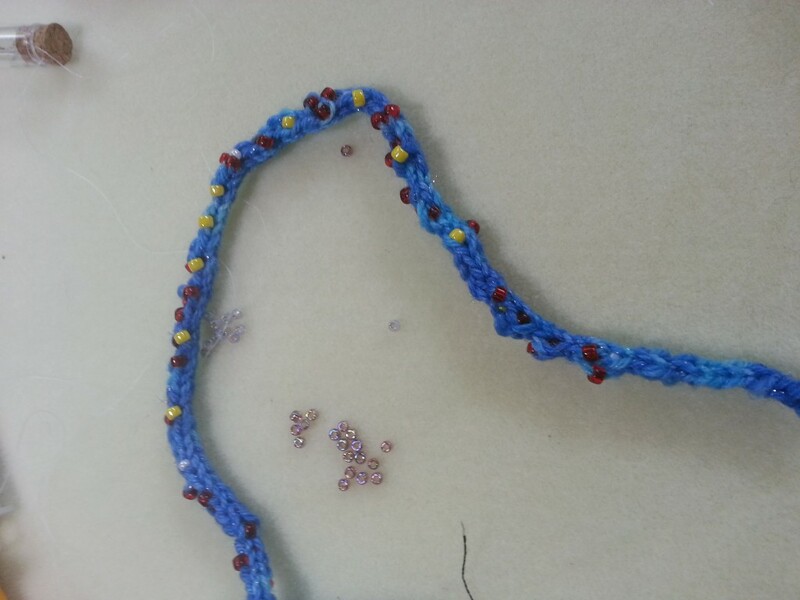 There are more options of things you can do with beads, and the projects are a lot faster to complete (in some cases) than knitting. 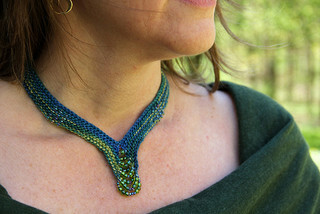 Plus, bead designs are available everywhere – you are more likely to see people wearing jewelry than a knitted item. It could become a daunting task to try to come up with new designs. Or maybe not? 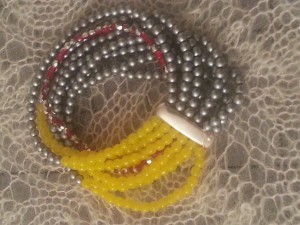 There are soooo many different types of beads and new bead types being produced that it may be easier to come up with combinations and patterns that are unique. On the other hand, knitters may come up with new knitting stitches or yarn / stitch combinations more than noticed or publicized. It is a fascinating world to be creative with so many choices. So the really cool thing is that I’ve come up with some ideas and looked online to see how other people have done them…and I can’t find anything! That is so exciting because it tells me that I am on to something new and different. 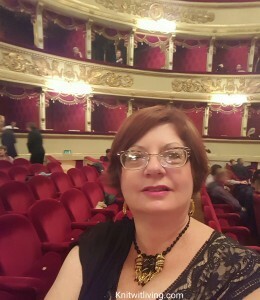 The first time this happened, I was making a necklace to wear to the opera in Milan. (I know, how lucky am I?!) I bought a fabulous dress and knew that I wanted to wear a necklace that was totally unique and made specifically for it. I had read about creating large beads from small ones – a fairly common idea – but then I decided to hang them from the necklace like little pendants. I could not find any advice on how to do that. What fun! 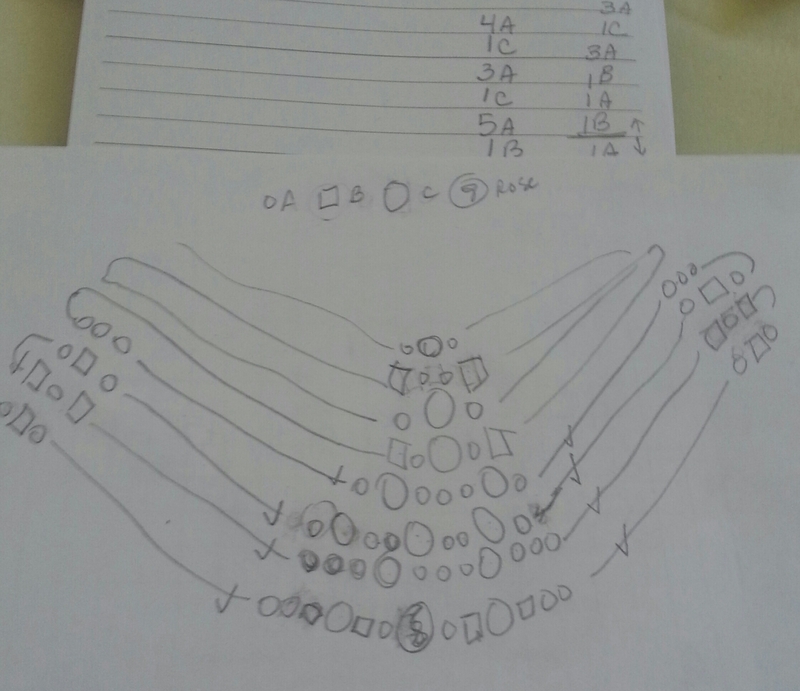 Like recipes, patterns are usually just recommendations, so this was actually perfect. I could do what I wanted to make it work. While planning the jewelry to take on my trip, I realized I had many necklaces but very few earrings. So I decided to take the major components of the different necklaces and make one pair of earrings that would go with them all. Call it funky, definitely call it unique. This is what I ended up with – and love! because I don’t think anyone else would ever put this combination together! Now, I’m playing with the herringbone stitch, which is a simple stitch but looks terribly advanced! 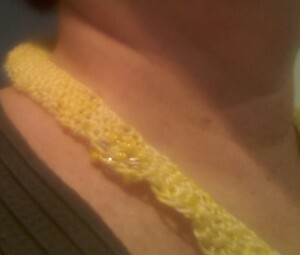 For some reason, I enjoy doing the tubular rather than the flat stitch. I think it’s more interesting to watch the product develop as a tube. This is a fairly standard spiral herringbone design, but in the middle section I have Swarovski crystals spiraling in the opposite direction. I made a point to have both sides match up. While not unique at all, this was a major challenge for an asymmetrically-driven crafter. It was a gift for a very symmetrically-oriented friend, who appreciated my extra effort in this regard! Here is my report of my July & August 2015 Reading. Lack of interest and summer activities kept me away from reading time. However, I did stumble upon the book Florence Gordon by Brian Morton in my local (e-)library about an intelligent cantankerous 75-year old woman and her relationships with her family, friends, and herself. I greatly enjoyed this book because it was so believable and I was able to relish, understand and empathize with each character’s perspective (and a few days after I finished it, I realized that Florence reminded me of my grandmother). I usually end my reading posts by selecting my favorite, but this month is different. It’s two months’ worth of reading and I’ve already shared the book I liked the most! Food Journeys of a Lifetime: 500 Extraordinary Places to Eat Around the Globe National Geographic Not great - ended up just perusing it. Then and Always Dani Atkins TERRIBLE!!!! 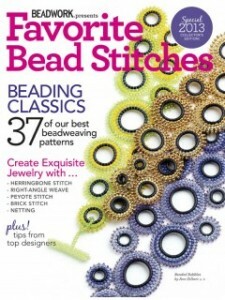 Favorite Bead Stitches, 2013 Beadwork Magazine Compilation Inspiring! I have had Penelope Fitzgerald on my To Read list for awhile, so I downloaded The Knox Brothers (a Sample) and The Bookshop (a Sample). I enjoyed neither sample and was very happy I didn’t make a full purchase of either! I also continued my Paris fascination by finishing The Paris Architect and purchasing A Paris Apartment (that I had seen someone reading at a community pool) and The Little Paris Bookshop. They went from Good to Okay to Un-finishable, respectively. The Paris Architect was good until the author didn’t know how to end it. That just cast a pall on the rest of the story. A Paris Apartment was a light summer read. I wouldn’t recommend it. I had been looking forward to The Little Paris Bookshop from a book review. Yet, I was not drawn to any of the characters and the story became so preposterous that I stopped after the first third. How disappointing. Consider the Fork: A History of How We Cook and Eat was on my Want to Read list for some time. I really like reading about how necessity becomes tradition & how common behaviors are influenced by our surroundings. Unfortunately, a lot of these food/society/tradition histories read like college thesis dissertations – which I’m betting many of them originally were. I just can’t get into that style of writing, and had to put it down. I was drawn to The Man Who Loved Books Too Much: The True Story of a Thief, a Detective, and a World of Literary Obsession because it was about a man who stole valuable old books. In the introduction, the author speaks about people stealing books from their libraries. GASP! I can’t imagine! 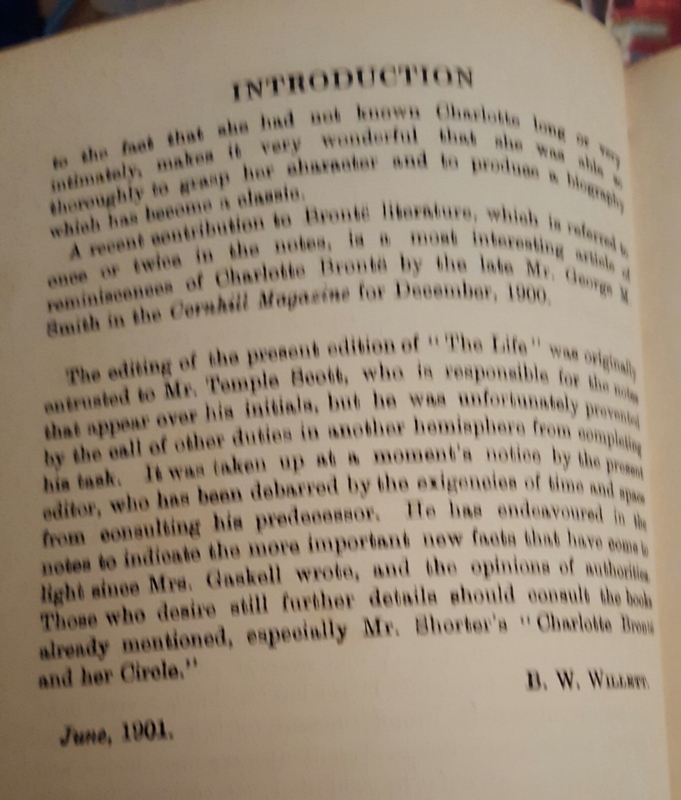 Well, actually, I have a very old copy of Mrs. Gaskell’s account of Charlotte Bronte. Tissue paper over the title page! I looked at it the other day, and in the back there was the little envelope where the date due card is inserted. For the life of me, I cannot remember if I “just never returned it” (they won’t miss it!) or if I bought it or some other scenario. I guess I could take it back and see if they want it. Egads! 4 cents a day since 1976! I did not enjoy The Man Who Loved Books Too Much because there was just too much detail and not enough action or interaction so I did not finish it. I was very disappointed because I really wanted to like it. 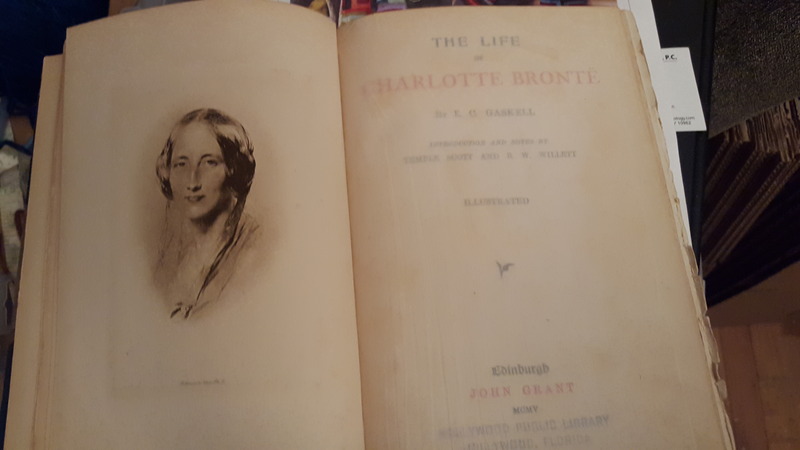 Then and Always – the worst book ever! 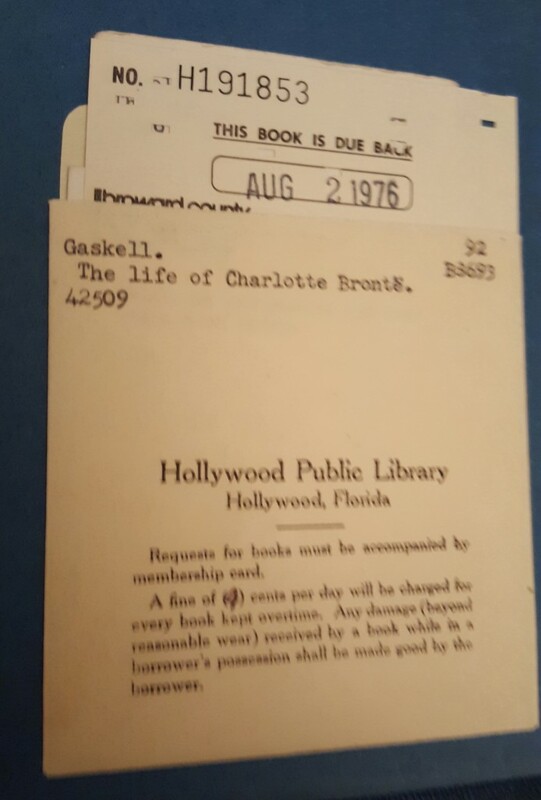 I borrowed it from the library’s e-collection. One of the problems with e-books is that you can’t pick them up and leaf through them. I felt like I was reading someone’s high school English creative writing paper. (It reminded me of a really bad paper my BFF and I wrote in high school! [You know who you are, and you also know to which paper I am referring!]) The ending was so stupid that I realized it WAS probably self-published. I sometimes judge myself of being a snob because I try to read only books that are published by a large company, but then I remember that at least those books have been edited and reviewed before being released. Not to say that all books published by a large publishing house are good, but at least they’ve already been vetted. The good news is that I read more books than I bought. Some months it’s been the reverse! The Life-Changing Magic of Tidying Up: The Japanese Art of Decluttering and Organizing is compelling. I am reading it bit by bit, activity by activity. So far I’ve cleaned out the clothes in my house. I got rid of 7 garbage bags of clothing, purses and shoes. Finally, my closet has only the clothes I really wear and/or really love! Books are next. I Am Pilgrim is a venture into new territory. My book club is reading it for our October session. It’s a thriller and it’s longer than what we usually read. My take on it so far (and I’m only at page 96 out of 785 at this point) is that I must like it a little because I haven’t picked up anything else to read at the same time. I thought that stringing would be super simple and almost didn’t even want to try it, but it is very appealing so decided to give it a go. I started with an Italian-themed necklace for a good friend. I arranged the beads, strung them, held it up as if I were trying it on, and it was just not balanced. I unstrung them, tried two other combinations before being satisfied. 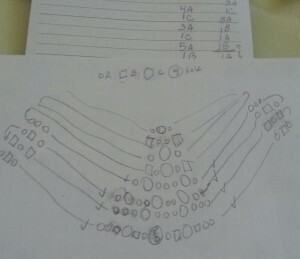 Then, dealing with the chain and the clasp and the jump rings was very intimidating! 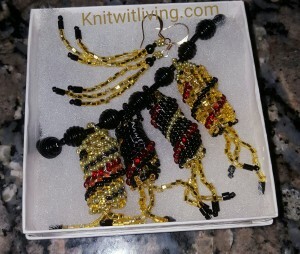 I’m glad I persevered – I was very happy with the results, and my friend loved the gift! The beads with the Italian images are made of paper and then shellacked. I found them on Etsy. 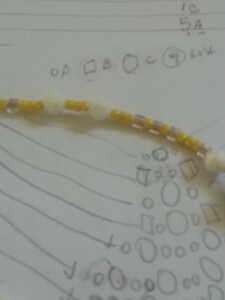 The round greenish beads with the dots around the circles are ceramic. The green squares, triangles and green beads are stone (jasper). 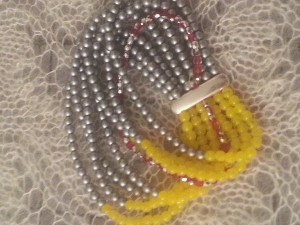 The gold and light green beads are freshwater pearls, and the small pink beads are glass seed beads. I found all these pieces in different places and loved putting them together. I also made a thank you gift for a friend with whom I stayed over the Fourth of July weekend. Again, balance, color, size, etc. 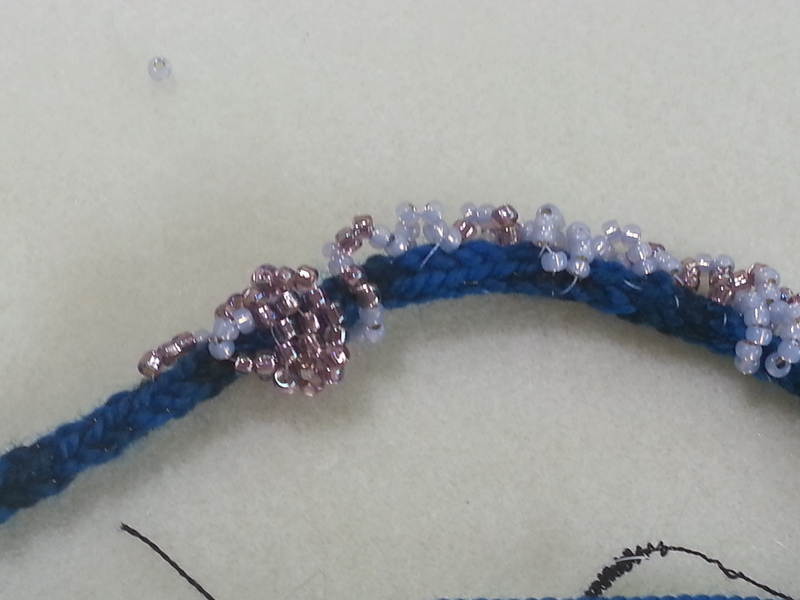 all come into play, as well as the technical skills to attach the clasp. The long oval orange striped beads are vintage paper mache that I found on Etsy. The pink dotted bauble at the bottom is glass. 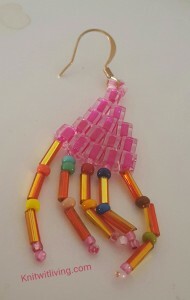 The orange and gold beads are vintage glass. 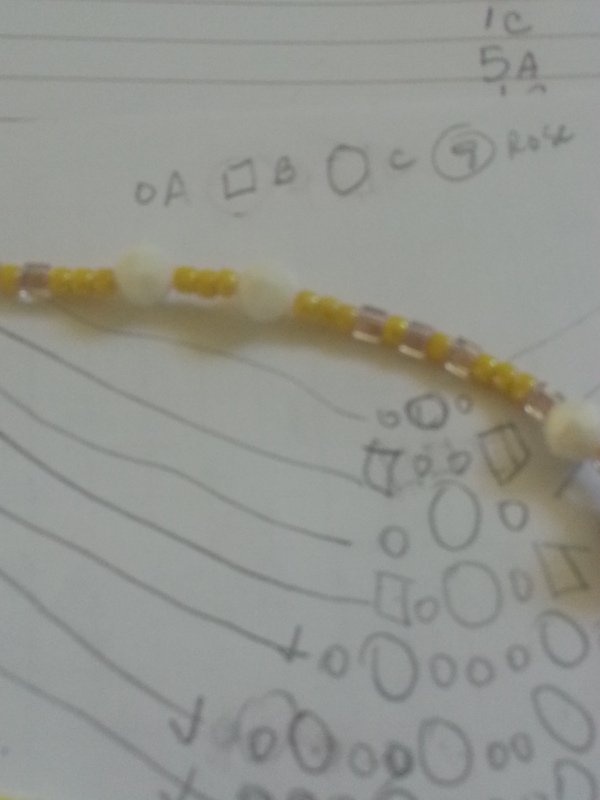 Again, the gold beads are freshwater pearls, and the small yellow and pinkish beige are glass seed beads. What fun pulling all these together! 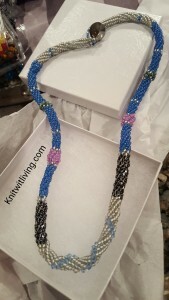 I decided to combine the “off loom bead weaving” with the stringing. 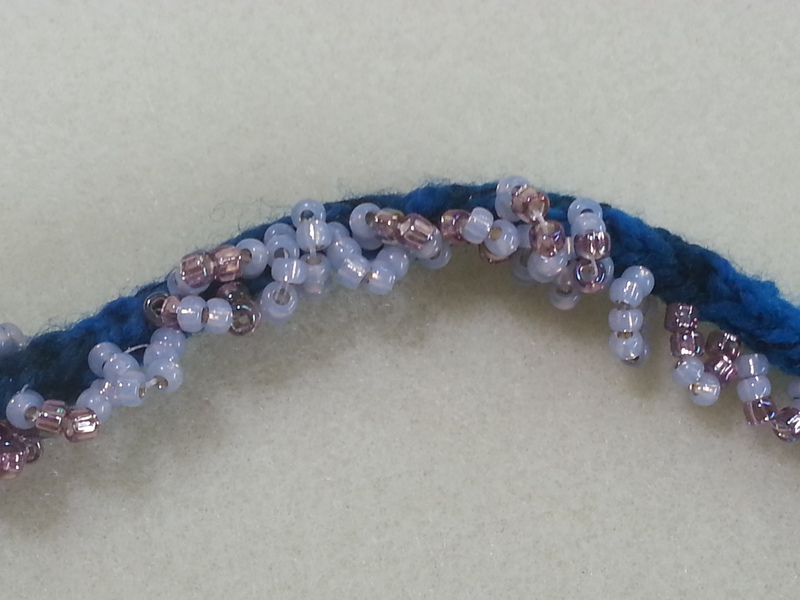 I started trying out a tubular peyote stitch (sounds like I know what I’m doing?!). It really started out as a practice, but I decided to continue with it. I had a sketch of what I thought I might do, but creativity took over in the process. I added two pieces of Jasper (the turquoise) and then a vintage bead cage surrounding another piece of Jasper. On to a ceramic piece before completing the circle. When I made it, I thought the two pieces of Jasper would be the focal point at the bottom of the necklace. 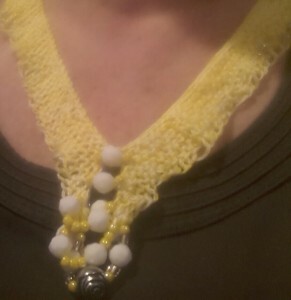 However as I wore it, it seemed to prefer to have the bead cage at the bottom. And you know what? I like it better that way too! Luckily, my hair is short so that the peyote and little fringe is still visible in the back. I like that twist, a little surprise for people to see. While I was at it, I made a necklace for another good friend, who enjoys stone necklaces. 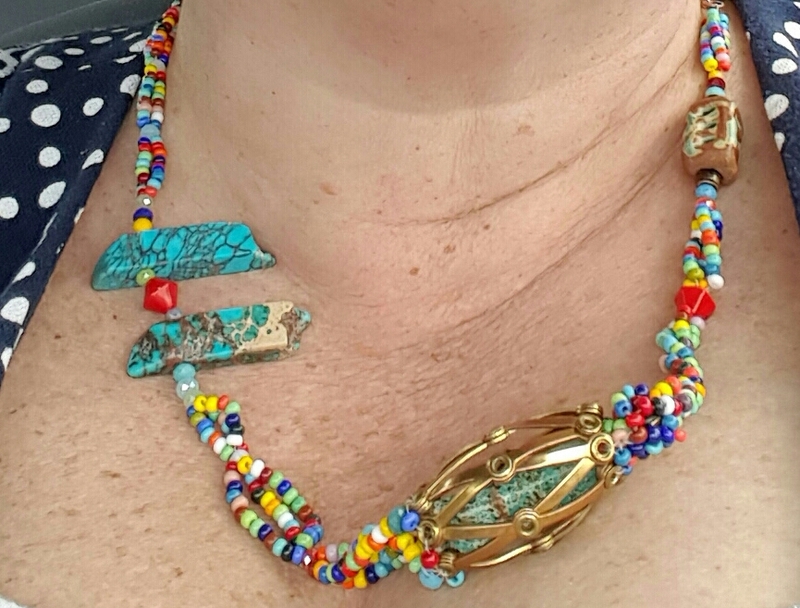 I also used the stone shapes that I used in the Italian necklace, as well as some sparkly glass beads in the squares, and some agate chunky beads. Instead of chain, I used some glass seed beads that glitter next to the stones. She loved it. I did too, but gave it to her anyway! A Replacement Life Boris Fishman Thumbs down; could not finish it. The Nightingale Kristin Hannah Loved it. The Red Notebook Antoine Laurain Loved it. Stringing, Spring 2014 Magazine Good ideas! Stringing, Spring 2013 Magazine Good ideas! Calling Invisible Women Jeanne Ray So so. First Frost Sarah Addison Allen Started, but returned to the library. Need to check it out again. Dearie: The Remarkable Life of Julia Child Bob Spitz Enjoyed it, did not get a chance to finish. May seemed like a long month in terms of reading in that I was able to read more than expected. I read a wide variety of materials and took advantage of my Book Bub emails to pick up some really good deals to add to my library and To Read list. My May reading covered a span of choices with a great many surprises of what I enjoyed, and met my expectation of at least 1 book that I did not like. Let’s start with that one. My Temple book club selection has consisted of at least 4 books by Russian male writers in their 30s whose families have migrated to the US. A Replacement Life by Boris Fishman is one such book (our previous book in this genre was The Betrayers, by David Bezmozgis). A Replacement Life tells the story of an aspiring writer (employed by a magazine) whose grandmother dies and his grandfather asks him to write his grandmother’s story to submit for a Holocaust payoff. I did not get very far in the book. I didn’t like the style of writing, and I couldn’t relate to the story or the characters. Surprisingly, I voraciously read The Nightingale by Kristin Hannah. The story, the characters and the writing had me hooked by page 5. At this point, I checked to see how many pages were in the book (440) so that it didn’t end too soon. I had been a bit reluctant to read another Holocaust book, but this one was absolutely captivating. It is from the perspective of non-Jews, which was eye-opening at how much they also suffered, and a story about the bravery of women was so refreshing. The characters’ relationships were fascinating, surprising, and moving. 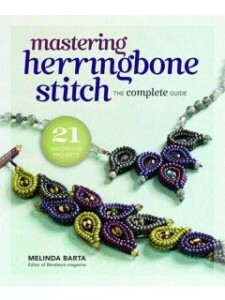 Dearie and Mrs. Queen were library audiobooks to be able to “read” while knitting. Dearie, about Julia Child, was good but I didn’t get a chance to get very far before I had to return it. Mrs. Queen Takes the Train, a contrived story about a monarch’s attempt to use modern technology, like a computer, and then figuring out the public transportation system, was just dreadful. I only listened to a couple of chapters (if that) before stopping. I picked up Wreck of the Medusa, the Prime of Miss Jean Brodie and the BBQ & Outdoor Grilling books through Book Bub, all for $2.00 or less. Wreck of the Medusa: Mutiny, Murder, and Survival on the High Seas, previously titled Death Raft (wow! ), is the true story of a shipwreck in 1816. My all-time favorite book, Dean King’s Skeletons of the Zahara, is a similar recounting of a shipwreck near the Sahara Desert, where the sailors were captured and then sold, and many survived! I am drawn to these survival stories. Maybe some past life connection? And who could resist a Muriel Spark at a good price? I find that whenever I read a good book, like The Nightingale, the next book has to be extra special. I did something right this time, because the next two books just pulled me right in! 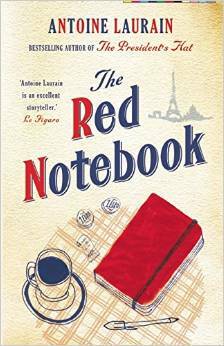 The first, The Red Notebook, by the French author Antoine Laurain and translated by Jane Aitken and Emily Boyce, is about a woman whose purse is stolen and the man who found it. It’s a story about fate, luck, possibilities, and relationships. I loved it. I found myself moved by it even when I wasn’t reading it, and when I didn’t even realize I was thinking about it. I recommended it to my book club and they’re reading it this month. I hope they enjoy it as much as I did! I seem to be on a new twist of reading translated French authors. I am currently reading The Elegance of the Hedgehog by Muriel Barbery. This book takes place in an expensive apartment building in Paris. One of the plots is about the super, who strives to meet her tenants’ expectations that she is slovenly and uneducated while enjoying the arts and philosophy in secret. The other plot is about a young girl who is tired of the stupidity of life and its inhabitants and is planning to end her life on her next birthday when she turns 16. I bought this book as a hard copy and I am so glad I did! It was one of those purchases of wandering around the bookstore and stumbling upon it. I’m happy that I have the hard copy (paperback) instead of digital because it’s easier to share with others, and it can be kept on the bookshelf to be seen (by me!) and remembered, and picked up again, unlike on a digital device. I was reading a bit before going to work this morning, and I thought that this might actually replace my favorite book, Skeletons of the Zahara by Dean King, that has been my go-to favorite for years. Hedgehog is so well-written, amusing, believable, intelligent, and keeps me wanting to read more each time I have to put it down. More on this book when I finish it in June. Yes, my favorite book this month…well, I really thought it was going to be The Nightingale. Then it was The Red Notebook. But now it is definitely The Elegance of the Hedgehog. 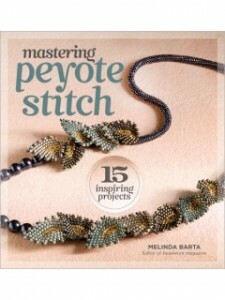 Knitting, beading, so many options! 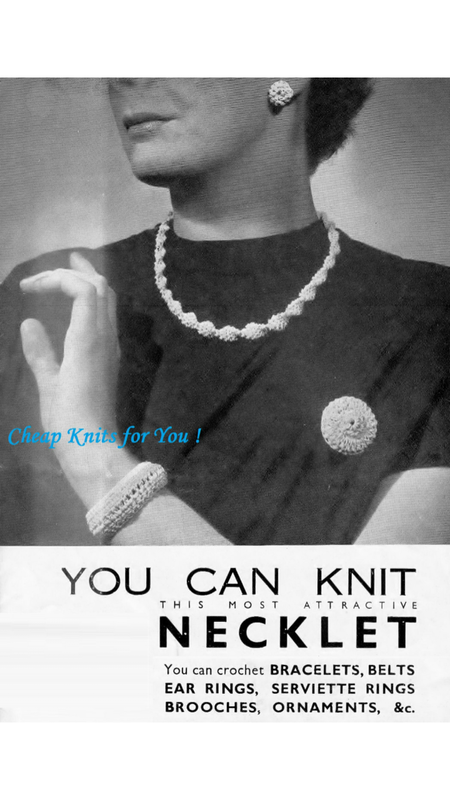 One thing I will say is that it’s a lot less expensive to make “a little purchase” of beads than yarn! Unfortunately, the bead merchants are just as prolific at sending out enticing emails as the knitting industry. I haven’t really accomplished much lately. I’m knitting a poncho for a friend so feel compelled not to do other knitting with such a large project on my plate. It’s not particularly complicated, just time consuming. More on that in another post. Well, I want to share some ideas that I tried but came out rather clumsily. 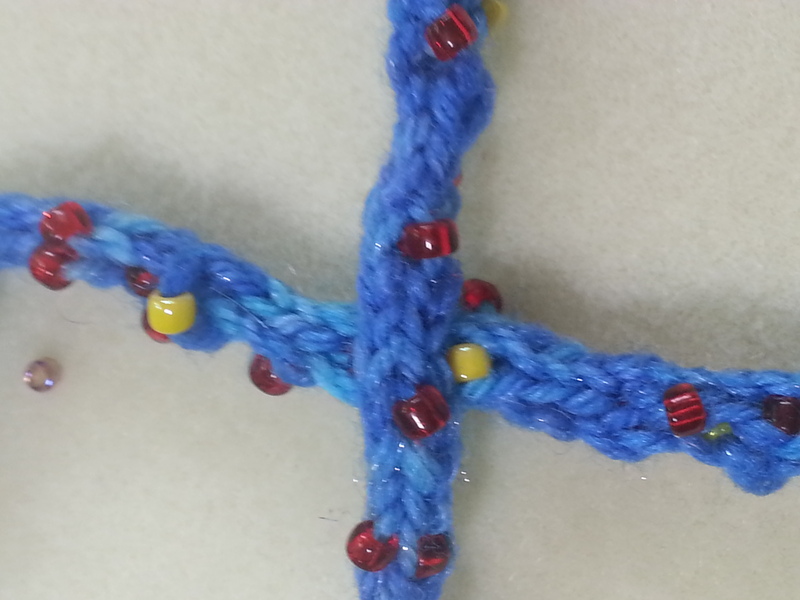 A lot of the beading patterns show rope like chains, so I thought what if I used an i-cord instead of a rope. What if the i-cord had beads in it? I tried placing the beads in different ways on the stitches. I’ll admit it’s interesting, but I don’t like the end result. 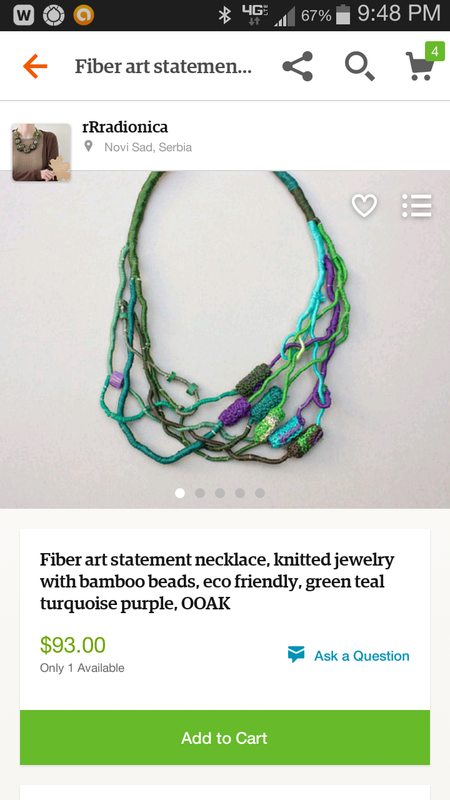 I found a shop on etsy, where the woman knits necklaces, and knits the pieces to look like beads. What’s old is (or can be) new again? 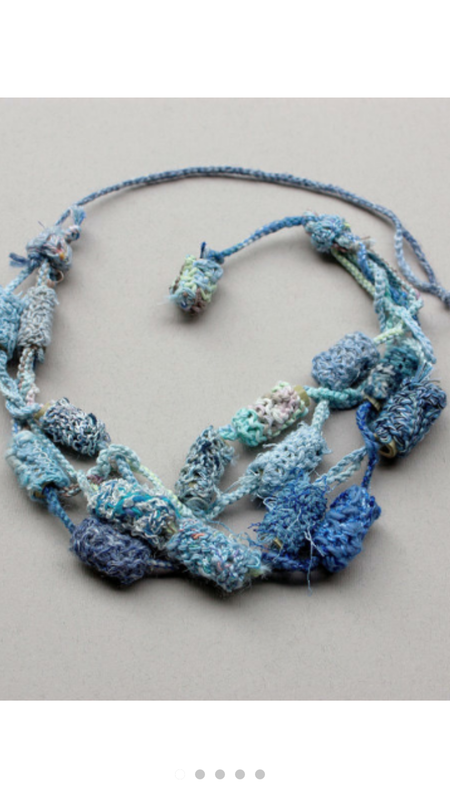 I tried stringing beads along an i-cord, but am not enthralled with this either. Luckily I have plenty of time and lots of ideas. And a poncho to keep me busy.